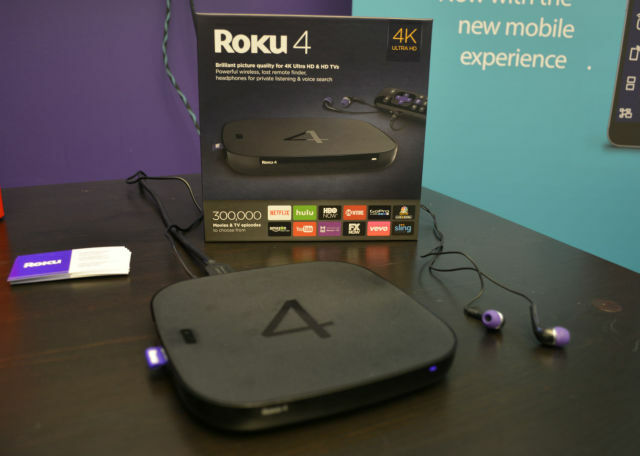 Roku has started taking pre-orders on the Roku 4, the company’s next-generation streaming media player that supports 4k Ultra HD video delivered via internet apps. Shipping on October 21st, the Roku 4 plays HEVC (H.265) video up to 3840 × 2160 resolution at 60 frames-per-second on 4K UHD TVs that support the high frame rate. Now that you’ve been enjoying Netflix movies and tons of Internet videos with Roku box, have you noticed that your Roku streaming player can do more than that? If you’re watching movies and shows with a Roku 4 model, you can play media on my from USB hard drive with the Roku 4 USB Media Player channel. Officially, the Roku 4 only supports MKV (H.264), MP4 (H.264), MOV (H.264), WMV (VC-1, firmware 3.1 only), meaning that’s the only media recognized over USB and Plex’ Direct Play. So if you want to enable Roku 4 to play Blu-ray files, all we need to do is to rip Blu-ray to Roku 4 supported video formats with a professional Blu-ray to Roku 4 Converter. The following guide tells you how to get movies off Blu-ray to hard drive for playback with Roku 4 (other models do not support USB channel). Pavtube BDMagic (Windows XP/2003/Vista/Windows 7/Windows 8/Windows 8.1/Windows 10 compatible). Read the review. For Mac users, you can turn to Pavtube BDMagic for Mac to Play 1080p Blu-ray Movies on Roku 4 via USB from Mac El Capitan. Trial limit– a Pavtube logo be printed on converted videos. Insert your Blu-ray to BD drive and lick the disc button to load Blu-ray movies to the program. The detailed information of your Blu-ray movie will be displayed. You can then preview them and choose the chapters you want to rip. With a USB stick connected Roku 4 plays up to 1080p videos in MP4, M4V, MOV, WMV and MKV format. Click Format > Common Video and set output video format as H.264 Video (*.mp4) or MKV(Matroska) Video (*.mkv) as the file size will be reasonable small and the video quality remains. A. Crop – Crop the video frame size for better visual effects on the player. B. 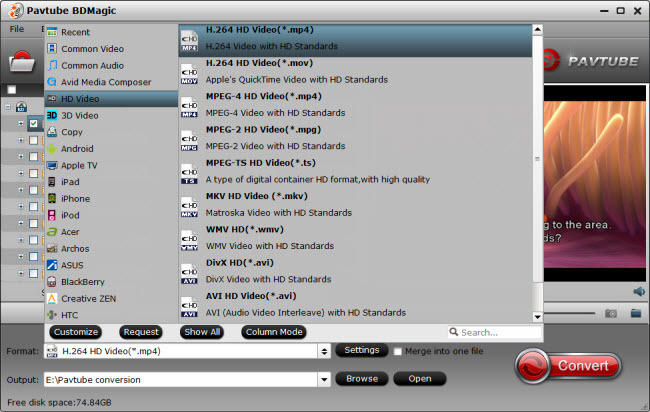 Trim – Split the video clips to choose your favorite part of the DVD movies. C. Effects – You can change the video parameters like brightness, saturation, contrast and more. After all preparations, click the Convert button to rip your Blu-ray movie to Roku 4. When the conversion completes, click Open to get the converted MP4 files and play them with Roku 4 via USB connection freely. 1. Keep your computer networked so that the program can hack the Blu-ray copy-protections. 2. To rip a Blu-ray movie from commercial Blu-ray Disc, you need to place it in a BD drive (either internal or external). 3. You’re advised to select “Common Video”>> “H.264 Video(*.mp4)” format in Step 3- it lets you downsize a DVD/Blu-ray to 3GB or so and keep the original size(DVD- 720×480(NTSC)/720×576(PAL) and Blu-ray- 1920×1080). 4. To keep both 1080p video and AC3 5.1 audio, choose MP4, MOV or MKV format from “HD Video” tab, then click “Settings” and set “medium quality” in “Bitrate”. Although Roku box does not directly decode AC3 or DTS 5.1 audio, it allows for audio pass-through, which means you can still enjoy 5.1 sounds with a standalone audio receiver connected. Also learn how to rip DVD to Roku for playing and here is mac solution to stream Blu-ray to Roku or backup DVD to Plex server.